A bullied teen in Tennessee is being surrounded by messages of support, and then some, from both celebrities and everyday folks, after a video his mother posted went viral. 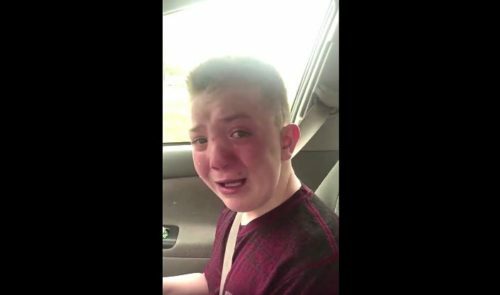 Keaton Jones’s mother posted a video to her Facebook page of her son detailing the verbal and physical abuse he has been subjected to at school by his peers, and, through tears, calling for an end to bullying. His mother explained that her son asked her to record the video, after she picked him up because he was too scared to go to lunch. He describes having milk poured on him, ham shoved down his clothes, and bread thrown at him during a previous lunch period. “Just out of curiosity, why do they bully? What’s the point of it? Why do you find joy in taking innocent people and finding a way to be mean to them. It’s not okay,” he says. The video went viral, and soon messages of support came pouring in, many using the hashtag #StandWithKeaton. Other celebrities sending love, and special invites to events, include Mark Ruffalo, Demi Lovato, Justin Bieber, Delanie Walker, and many more. The hashtag is also showing up IRL. Tennessee Tech has even offered him a scholarship. Those bullies ought to be feeling pretty awful right about now. And Keaton is probably feeling pretty great. Don’t you love when a story has a happy ending?